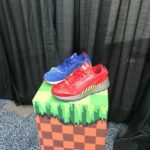 As part of their promotion of their Sonic branded sneakers, PUMA has set up a display outside of E3’s West Hall. The display isn’t simply showing off the $130 sneakers, though. 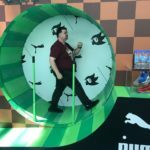 The display also includes a recreation of Green Hill’s famous loop-de-loop! The loop isn’t just a piece of cardboard either, as it also contains a giant, fully functional hamster wheel. Unfortunately, people were apparently hurting themselves on the wheel before we arrived, and my cohort Jason Berry had to sign a liability waver before he could even stand on it for the picture I took below. As of now, walking on the wheel is no longer allowed, and the movement will be disable tomorrow. < Previous Post Previous post: Sonic confirmed for another round in Smash Bros Switch UPDATE: With Knuckles! who injures themselves on a tube with handle bars? these things operate in fun houses no problem. public are bumbasses. I took a more dramatic pose of me looking like I was gonna run up it, but putting my weight on my leg made the wheel move forward and I almost tripped, The inside is made of the same rough, non slip material you see on pool steps, so I could easily see how someone could fall and scratch themselves. Who bother. It’s sold out.